Move over Alex Trebek, Mark Eitzel wants your job. (With his upbeat demeanor and penchant for suits, this probably seems obvious.) The American Music Club frontman is preparing for the October 2 release of Don’t Be A Stranger via Merge by releasing a series of trivia questions via the AMC website. Each Wednesday from now through September 26th, there will be an Eitzel-related trivia question posted… with the answer revealed the following Tuesday. The answers will be tallied and the top 3 contestants (top 3 from the US and top 3 from Europe/Australia/New Zealand) with the most correct answers will win a smattering of Eitzel-related prizes, including concert tickets, autographed albums and more. What, no Turtle Wax or Rice-a-Roni? The first three questions are up and ready to go. How many can you answer? Meanwhile, all of you cheaters in NYC won’t be able to snag the answers from Eitzel himself in time to make the contest; the man won’t swing through the five boroughs until Dec 3 at Highline Ballroom. Tickets are on sale. 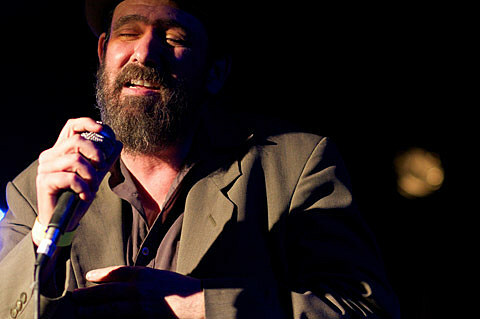 The dates are part of a larger East Coast tour for Eitzel, all of which are listed below. In anticipation of the new LP, head below for a stream of “I Love You But You’re Dead.” Mark Eitzel is currently trying to update his image, consulting Billy B (Lady Gaga’s makeup artist) and Nadya Ginsburg (writer for “Joan Rivers Fashion Police”) to make sure he knows what the kids are up to. Grab your notepads and head below to check out video on their advice to Mark.